Following John Hinton’s departure from the Cardington Police Department to begin his position with the Morrow County Sheriff’s Office, village council has approved James Wallace as his replacement. Wallace was sworn-in by Cardington Mayor Susie Peyton at Monday night’s council meeting. Courtesy photo Newly appointed Cardington Police Chief James Wallace being congratulated by Cardington Mayor Susie Peyton immediately after she gave him the oath of office. 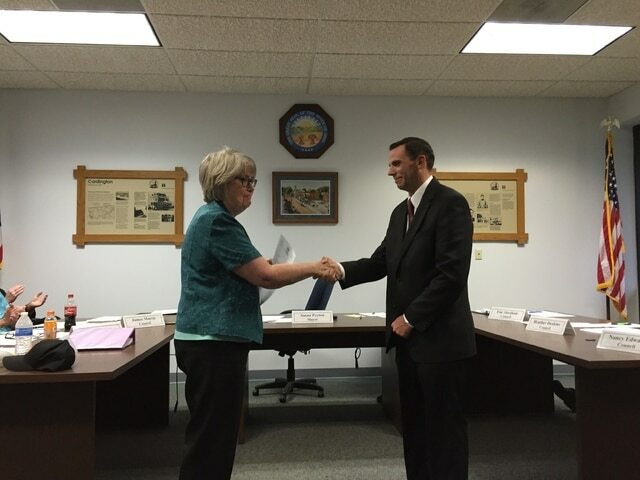 http://aimmedianetwork.com/wp-content/uploads/sites/29/2016/04/web1_Police-Chief-James-Wallace.jpgCourtesy photo Newly appointed Cardington Police Chief James Wallace being congratulated by Cardington Mayor Susie Peyton immediately after she gave him the oath of office.